Honey has been used since ancient times for health, beauty, and medicinal purposes. It is thought that just one small spoonful a day is potent enough to provide us with touches of its nutritional and beautifying benefits. There is a reason it was deemed “the nectar of the Gods”. There are many types of honey on the market so it’s confusing to the untrained eye as to what nature of honey is actually best. Raw honey is typically supported by its pronounced level of bioactive plant compounds and antioxidant properties, and of course is 100% natural and sourced from the hard work of the honey bee. The darker the honey, the more benefits it tends to hold; the number of bioactive compounds and antioxidant values are higher. Here we take a closer look at honey and how it can sweeten your health! Using honey to sweeten our beverages and in-home cooking (such as breakfast pancakes and healthy snacks like oat bars) is just one way of stepping back from the high sugar trap of modern living. It is the small changes we make that add up. Although honey doesn’t contain vitamins and minerals, it is its high antioxidant value that really makes the difference to our health. Honey helps to raise the levels of good cholesterol and lower blood pressure, and so over time, it can potentially impact our heart health too. Honey is carbohydrate-rich, and as this is our main source of fuel it can provide us with a high dose of natural energy when we need a little boost. Rather than reach for seemingly healthy (although very calorific) energy bars, we can invent our own. Refined sugars are empty calories that contain no nutritional benefits, yet if we look closely at the well-intended health snacks we buy- we may find it as an ingredient more often than not. Honey is also anti-viral, anti-bacterial and anti-inflammatory, which helps to support and strengthen our immune system. Three Peaks™ produce the world’s most magnificent Manuka honey. Artisanal production and a commitment to bee health, sustainable land conservation and quality in all they do, means the stunning Three Peaks™ packaging reflects the quality of the certified authentic Manuka honey in each jar. Three Peaks’™ home is the volcanic central plateau of New Zealand’s North Island – an area held up as a national treasure for its rugged wilderness and spectacular scenery whose heart is the UNESCO World Heritage Site Tongariro National Park. As a volcanic plateau, the area creates a unique ecosystem supporting abundant flora and fauna amongst a rugged and harsh environment. Here, in remote valleys, Manuka plants flourish and thrive. Beekeepers venture deep into the remote country to carefully tend their bees. For Three Peaks™, bee health is one of their highest priorities – that and sustainable conservation and restoration of the land they own. As owners of their own 1400 hectare farm, Three Peaks™ are creating sheltered sites for beehives on the farm, planting thousands of native trees, improving water quality and protecting the large areas of untouched native forest on the property where rare native kiwi birds live. What makes Three Peaks™ Manuka Honey special? It is tested and certified by an independent laboratory, in accordance with the rules set down by the UMFHA. The UMF™ rating on each pack of Three Peaks™ Manuka honey represents the proportion of unique signature compounds characterizing Manuka honey that are present in each batch. In all, Manuka honey contains over 200 compounds not seen in other honey and in particular the medicinal trilogy of leptosperin, dihydroxyacetone (DHA) and methlglyoxyl (MGO) help make up the UMF™ rating. The higher the UMF™ rating, the higher the proportion of unique signature compounds found in that honey. To ensure you are buying genuine true-to-label Manuka honey, always buy genuine UMF™ graded honey, and always buy the highest UMF™ rated honey you can. Genuine Manuka honey is unique to New Zealand. Produced for only a few weeks each year, when honey bees gather nectar from the flowers of the native New Zealand Manuka tree (Leptospermum scoparium), then return to the hive to create an incredible, distinctive honey. Manuka honey’s high value and loyal following is the result of its scientifically-proven health and wellness properties and its rarity. Designed in New Zealand to reference its namesake Mount Tongariro in the Tongariro National Park. Glamorous and luxurious, the clear glass jar allows the golden color of the honey to be seen and celebrated, while the gold-foiled packaging adds to the ultra-premium look and feel. Three Peaks™ UMF 6+, UMF 8+ and UMF 10+ Manuka honey completes their range. These three products are packaged in a clear plastic 500g jar inside a stylish carton – the simple design and gold foil adds to the ultra-premium look and feel of the product. 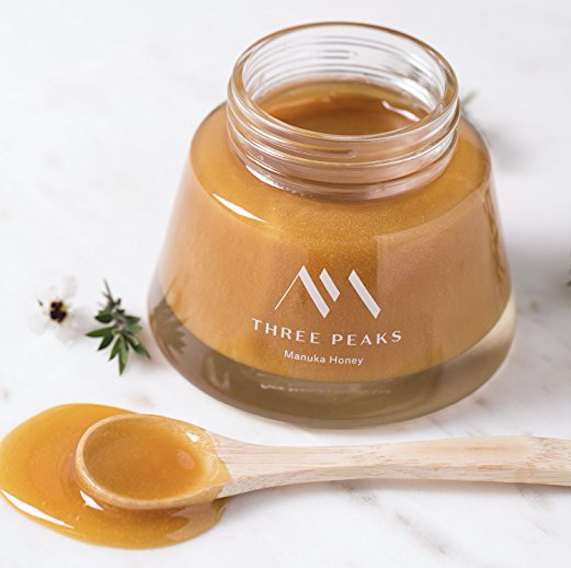 Three Peaks™ Manuka honey has a rich, velvety flavor that echoes the strength and depth of the environment it comes from. A lingering finish and complex toffee-like notes mean tasting this Manuka honey is a fine-food experience. As discerning producers, Three Peaks™ maintain high-quality standards for the quality and flavor profile of their honey – this means that only the finest quality Manuka honey bears the Three Peaks™ brand. The recommended serving is at least 1 teaspoon daily that can be added to tea or coffee as a natural sweetener, here are some other ways to enjoy it! A fine food ingredient or a health and wellness supplement but be aware that while delicious in cooking, the unique properties of Manuka honey have the best effect when it is not cooked. Remember that honey is not suitable for infants under 12 months of age! Three Peaks™ Manuka honey is traceable back to the hives it comes from and the land on which it was produced. Each batch of honey is traced through every step of its journey from the beehive to the customer. Customers can enter their batch details on the Three Peaks™ website to ensure the honey they have purchased is genuine, pure New Zealand Manuka honey. All Three Peaks™ Manuka honey is independently certified by stringent NZ UMF Honey Association (UMFHA) purity and quality standards – which means customers can trust that Three Peaks™ is true-to-label high-quality Manuka honey.